In 2004 it won the James Beard Award for Best New Restaurant in America. As such, it was the first Las Vegas restaurant to win a James Beard Award of any kind. In its heyday (from ‘o3-’07), it boasted a more top young talent in its kitchen than almost every other restaurant in Las Vegas combined. It was the first restaurant we took John Mariani to after his infamous “Las Vegas is all smoke and mirrors” article in Esquire. 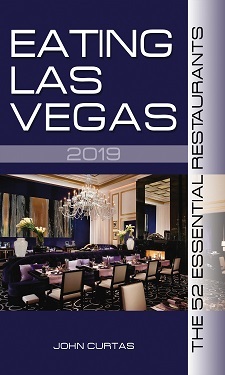 It was also the first restaurant the F & B mavens of the MGM and Caesars took Joel Robuchon and Guy Savoy to in 2004, when they were trying to convince them to take Las Vegas seriously as a food and restaurant destination. Both Savoy and Robuchon have told ELV it was the place that convinced them there was both a market for, and kitchen talent in town to support their exalted visions of fine restaurant dining. Rick Moonen also told us he probably wouldn’t have come to Vegas, had he not been blown away by his meal at BO in ‘o4. Almost all of those hot young chefs: Adam Sobel, David Varley, Gerald Chin, Sven Meade, Bryan Ogden, Todd Williams, et al, are still making their serious mark(s) on American gastronomy. Its butter-and-red-wine-basted sirloin burger was, and will forever be, etched in ELV’s brain as the ne plus ultra of ground meat sandwiches. And finally, its blue corn muffins are the only food ELV has ever stolen from a bread basket. But all good things must come to an end, and Bradley Ogden, both the man and the restaurant, has played out its string in our humble burg….soon to be replaced by a Gordon Ramsay gastropub. And even though the restaurant seemed to have lost its mojo over the past few years, and even though we were predicting its demise long before the official announcement came, many of us in the food community are mourning its passing, as well as a time when the possibilities for food and chefs and restaurants in Las Vegas seemed limitless. CAFE BERLIN – Belly Bombs Away! For the last 5 years or so and ever since I first heard of the famous bar burger,one of my first stops in Las Vegas has been the bar at Bradley Ogden for a burger and fries. When my buds and/or female companions protested ” we can get good hamburgers at home” I would reply-“not like this one” and all eventually agreed. I’ll miss it. John, let’s be real here…..the hotel never helped them much, and how many, jeez I lost count, food and bev guru’s(ha) have passed thru this place…they have and will alway have an identity crisis, this is just a part of this property….Bradely was good, not great and as far as price was way out of bounds for its time. ..
Do we really need another Gordon Ramsey restaurant in this space? What’s that now, 3 restaurants in (or coming to) Vegas? What’s he trying to be, the Cirque du Soleil of the restaurant world? MGM has Cirque in every resort, Caesars has Gordon. I haven’t been to a Ramsey restaurant yet, so I can’t give him a thumbs up or thumbs down, but I’m sure getting tired of all the publicity surrounding him. Reminds me of how I get burned out on political advertising long before election day. I hope his places can live up to the hype. You mentioned and listed the insane amount of young talent in that kitchen, most of who returned for the closing party, but you forgot the man behind the dessert program who’s in the above photo donning the cap. Ralph Perrazzo is one of my favorite purveyors of the sweet stuff and he deserves some love as well! Just saying .. I once had there the worst meal I ever paid $200 for. I went there once and enjoyed it. It was just for lunch and wanted to dip my feet in the water slowly. My wife had the hand chopped NY steak burger (I think) and when she asked for a slice of tomato to put on the burger she was told no. I understand seasonality and not wanting to pollute a great meal with a tomato that had sat in a refrigerator car for months or whatever. But I no better than to tell her no. Especially when the snack bar next door had plenty of slice tomato that had been sitting in their little sandwich refrigerator for days. I was not allowed to go back. I heard a story (probably myth) that a chef at Caesars refused to make a pedestrian dish for a high roller at the upscale Chinese restaurant many years ago. The High Roller took his money and walked across the street where he could have whatever he wanted and the chef was fired. Perhaps the property didn’t support the restaurant because the chef refused to serve a slice of tomato with a burger to the wrong person one too many times. Just a guess. Question on one of the photos: Who’s that dark haired guy in glasses who looks kind of like John Curtas’ much younger brother?? ?